To cure the corruption of gerrymandering, take the profit out of it. The Constitution provides the standard for doing so by specifiying that representatives are to be chosen “by the People of the several States.” That provision followed debate in the convention of 1787 that, according to James Madison’s notes, explicitly rejected the option of empowering state legislatures to choose members of the federal house of representatives. In practice, by asserting authority to draw congressional district lines on a partisan basis, state legislatures have usurped the power vested by the Constitution in the people of the states. Analysis demonstrates that allocating seats in the House according to the statewide vote of the people would produce a national legislature comparable in partisan balance to the current House, but with much greater equity among the parties at the state level. Applying that constitutional mechanism would rob parties of the advantage sought from gerrymandering and create incentives for the fair redistricting procedures that courts and citizens have long sought. This study illustrates the outcomes that would result, increasing competitiveness in 39 states. The commotion over gerrymandering forces fresh thinking on how to define congressional districts. One promising start on the issue, proposed by former Democratic Congressman Stephen Neal of North Carolina, invokes the spirit of the late Justice Antonin Scalia: Look to the Constitution for the original distinction between the method for electing senators and the one for choosing representatives. The standard was clear: Senators were to be chosen by state legislatures but members of the House of Representatives were to be chosen “by the People of the several States.” The 17th amendment changed election of Senators to popular vote but the standard for electing representatives has remained unchanged. Vesting the power to choose members of the lower house in the people of each state was not uncontested in the constitutional convention. Interestingly, James Madison’s notes on the convention debates report that Elbridge Gerry was one of those wary of that provision; experience in Massachusetts had shown him the danger of popular elections. Madison recorded Gerry as saying that “the people do not want virtue but are the dupes of pretended patriots…they are daily misled into the most baleful measures and opinions, by the false reports of designing men.” George Mason and others argued powerfully that the House was to be “the grand depository of the democratic principle” and should be drawn immediately from the people. The debate moved Gerry and his Massachusetts delegation to join in the majority approval of that position, with only New Jersey and South Carolina opposing it. Somewhat ironically, in practice state legislatures gained control over election of House members through asserting power to define congressional districts. That power enables the gerrymandering that distorts elections. In the political vernacular, by composing partisan districts for both state and federal offices, representatives have come to choose their voters instead of voters choosing their representatives. Several states are struggling to overcome this corruption of representative democracy by removing redistricting authority from state legislatures and placing it with independent commissions. A commission proposal now rising in Virginia is a notably lucid one that could go far toward eliminating the evil, but it faces a long and uncertain road to enactment. Whatever methods are chosen to define congressional districts, is there a way to apply the pristine constitutional standard—election by the people of each state—to govern the process? Yes. The statewide electorate is the relevant population unit under the Constitution. How might that broad category be applied to determine the results of House district elections? One option is to allocate the number of House seats in each state according to the percentages of each party’s vote for House seats on a statewide basis. Parties would continue to present individual candidates in each district, but those districts would be drawn without regard to partisan considerations. In keeping with general requirements set by law and the courts, all districts would have approximately equal populations, reasonable compactness and, so far as possible, take account of existing county and other jurisdictional lines. Following the American tradition of single-member districts, a crucial objective would be to anchor each representative in a specific district. A straightforward process could mesh the statewide electoral outcome with the results in each district. Take a hypothetical state with 10 congressional districts. Imagine that party A wins a statewide total of 60 percent of the votes cast for the House, and party B attracts 40 percent. Those results would entitle party A to six of the state’s 10 congressional seats, with party B earning four seats. Beyond the issue of allocation of seats, one must consider the distribution of them. Which party would get which district? The state could assign a seat to each of party A’s six top vote gatherers by district. By definition, some would have exceeded the statewide percentage their party achieved; others would have fallen below that number. Yet each would have campaigned in the district they would represent. Similarly, the remaining districts would go to party B’s four best performing candidates at the district level, some of whom might not have attracted a majority of votes in that district. As with any electoral design, there are likely to be anomalies, especially as the statewide disparity in votes grows wider. Still, they certainly would decline if districts were no longer gerrymandered to amplify or diminish partisan concentrations. Moving beyond this hypothetical illustration, how might the alternative constitutional standard actually affect today’s alignments in the House? Seven states already meet the standard since they have single representatives chosen at large. Broadly speaking, by curbing gerrymandering, it appears the plan would engender greater competition in 39 states—for example, it would have shifted 36 seats to Republicans and 33 seats to Democrats in 2018. 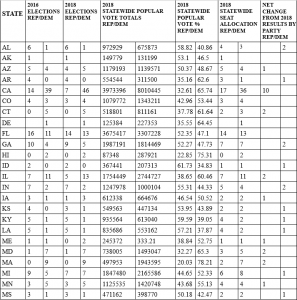 The following table outlines the profile of the House as elected in 2016 and 2018 compared to how it would look if seats were allocated on the basis of statewide results. 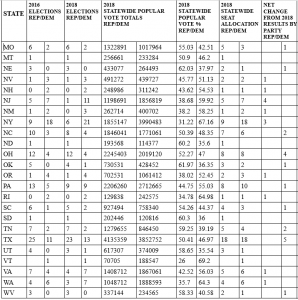 *Totals taken from Wikipedia, except for columns showing nominal 2018 statewide seat allocations and net change from 2018 results under statewide allocations by popular vote percentage. Because of third-party votes, there are some debatable allocations, e.g. in Missouri, New York, Texas and Utah. In Texas, the two leading parties clearly won 18 and 17 seats, respectively. With such a close statewide vote, the table arbitrarily favors the trailing party and allocates the 36th and final seat to produce an even 18/18 split in the delegation. One seat in North Carolina is contested and currently empty; statewide allocation would produce a 7/6 split. To account for third party votes, an equitable formula might assign seats to any party that earns 1/N fraction of the statewide vote where N = #seats in state, e.g. in Virginia 1/13. No party except Republicans and Democrats met that standard on a statewide basis in the 2018 House elections. In Texas. the Libertarian party came close, winning 2.3 percent statewide, less than 50,000 votes short of what would have earned a seat if this rule were in force. Alternatively, to avoid excessive fragmentation of its congressional delegation, it might be prudent for a state to establish a threshold of five or 10 percent of the statewide vote for a party to qualify for a seat. As an arbitrary rule to account for all votes cast when only two parties qualify for one or more seats on a statewide basis, votes for third parties could be allocated equally to the top two parties that qualify for seats. (Arguably, that allocation should best be in proportion to the percentages earned by the parties receiving the votes assigned from third parties.) That calculation has not been done for this table so vote numbers and percentages do not total 100 percent. A preferential voting system would solve the problem democratically by allowing each voter to designate a second choice to receive his/her vote if that voter’s favored candidate did not win. In calculating the allocation of seats, percentages are rounded up or down. Where neither party’s number rounds up—often because of the effect of third-party votes on the total tabulations—this rounding is done to favor the trailing party. That arbitrary choice could better be done thorough calculation and assignment of third-party votes, which were significant in some states. With the 9th district in North Carolina still in dispute, only 434 members have been seated as of this writing. In reviewing the chart, a few observations are appropriate. The overall national impact looks comparable to the results under the current districting system. The partisan balance would not shift much, but it would change geographically. There are significant consequences for the parties in many states; the effects go in different directions in different states. Therefore, state level parties are likely to favor or oppose such a change depending on their local calculations. Generally, the trailing party—that is, the party with the second rank in a state—stands to benefit (at the expense, of course, of the party that now has the advantage). A hard task comes after allocation of seats on a statewide basis. How are the seats to be distributed district by district? One idea is to use the rank order of each party’s candidates by percentage won in each district. If one party was entitled to six of 10 seats, for example, that party’s six top vote getters would claim a seat in their district; the highest ranking six candidates by district percentages would earn their seats. This approach would not preclude results in which a candidate winning most votes in a district would be denied a seat. Again, in a nominal 6:4 allocation in a state with 10 seats, the same principle would apply to assigning seats to the second party, with candidates claiming the four allocated districts in order of the percentages they won. Some candidates may have earned a majority in the district, but that result is not guaranteed, so anomalies are likely. Obviously, these are probable in a system gerrymandered to concentrate or dilute partisans. They should be less likely in districts redrawn without geographic and demographic contortions straining for partisan advantage. A key conclusion is that allocating seats this way would make states with more than one congressional seat more competitive. Major parties already offer candidates in most districts, but it would behoove them to nominate a candidate in every district to maximize their statewide totals even if they did not win the specific district. Candidates themselves should find non-gerrymandered districts more appealing if for no other reason that it would be less fatiguing to run in districts more compact than those contorted by gerrymandering. It is doubtful that parties or state legislatures would embrace this initiative of their own accord. The constitutional standard is most likely to be applied by the Supreme Court, which may be reassured that the national calculations do not appear disruptive, but still perplexed by the differing impacts on individual state delegations. One cannot accurately gauge the effect on particular districts until gerrymandering is prohibited and more rational districts are drawn. Who would have incentive and standing to present the question to the courts? Based these calculations, Republicans in California and Democrats in Texas could find their interests served by seeking court action to establish the statewide standard as constitutionally required. Litigation is already moving forward to challenge gerrymandering in several states, notably in North Carolina and Maryland. The Supreme Court has scheduled arguments for March 2019 on cases from those states. Plaintiffs in one or more of those cases might find the Court sympathetic to this analysis. Prior to retiring from the Court, Justice Anthony Kennedy was disturbed by gerrymandering and seemed to search for an objective rule the Court could apply to govern the abuse, instead of treating it as non-justiciable. This concept satisfies that requirement. (One wonders whether his former clerks, Neil Gorsuch and Brett Kavanagh, would share similar inclinations.) Nevertheless, one should not expect the proposal to reduce the Court’s reticence on this issue without protracted deliberation. The Court should find the argument for applying the standard fortified by Madison’s notes on the debates in the constitutional convention. Invoking this founding provision would highlight the fact that legislatures over time have effectively frustrated the founding fathers’ intention. It is the corruption of the legislature’s districting power through gerrymandering that argues for applying the original constitutional guidance to assign seats based on the statewide votes of the people themselves. The constitutional standard has the virtue of forcing candidates to compete in each district but with an eye on the statewide outcome. It guarantees fair distribution of seats and assures that a runner-up party cannot be denied representation proportionate to its performance in the state as a whole. Using the category specified in the Constitution meets the one person-one vote requirement prescribed by the Supreme Court (taking the state, not the district, as the category to measure). This plan certainly would alter the dynamics of competition in most states, but it is less clear whether it would diminish the polarization that afflicts the country. One can speculate—and hope—that forcing candidates in each district to take into account broader interests of the entire state would move them toward more centrist stances and open space for bipartisan cooperation once in office. Reviving the original standard chosen by the convention would take the profit out of gerrymandering. The Court’s decision would put an end to the grotesque cartographies that current practices encourage and point the way to shaping districts that would facilitate fair elections. There are other approaches to regulating gerrymandering. In some circumstances there may be reasons to prefer one or another of them. As a constitutional matter, however, there is a sound argument for pristine application of the principle outlined here: The total number of votes cast for congressional representatives in each state should define the allocation of House seats in that state. Author: Alton Frye is the Presidential Senior Fellow Emeritus of the Council on Foreign Relations. In more than 30 years at the Council, he has served in many roles, including president, senior vice president and national director. Frye founded both the Council’s Washington program and its national program, leading the organization’s development into a national institution. The author of A Responsible Congress: The Politics of National Security and Fellow of the National Academy of Public Administration, he can be reached at [email protected].